In this section, we cover the basic principals of using electromagnetic geophysical surveys to address geologic, environmental or geotechnical questions. 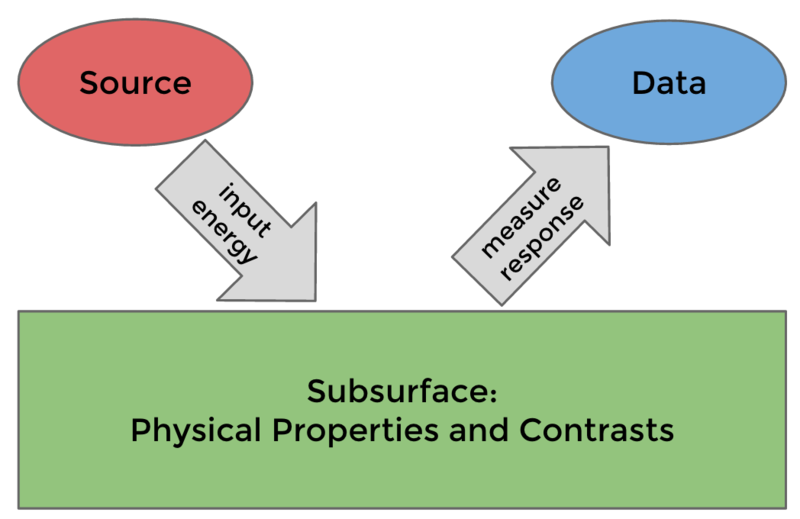 In the fundamentals, we discuss a seven step process for selecting, performing and interpreting results from electromagnetic geophysical surveys to address the question at hand. Experiments can be classified by the type of source and source-waveform used to excite responses in the subsurface. Direct Current Resistivity experiments use steady-state currents, Airborne Frequency Domain experiments use time-harmonic signals, and Airborne Time Domain experiments use transient waveform. The primary physical property targeted for each of these experiments is the same: electrical conductivity. However, each type of survey excites the responses in the subsurface differently, and depending on the target, the data collected in one survey may be more suitable for detecting and characterizing that target.